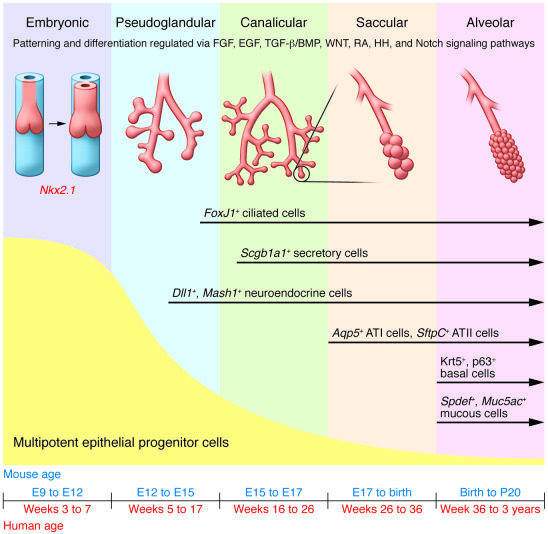 Lung development in both mouse and human progresses through five overlapping phases based on successive branching: embryonic, pseudoglandular, canalicular, saccular, and alveolar (9). The epithelium is initially composed of multipotent progenitor cells that proliferate and differentiate through development to yield more restricted, differentiated progeny that make up the developed lung epithelium. Signaling pathways that maintain the multipotent progenitor pool are indicated. HH, hedgehog; RA, retinoic acid.